Anusha Dilrukshi Kodituwakku became the first ever Sri Lankan woman boxer to enter a semifinal in a Commonwealth Games as she beat Cayman Islands’ Brandy Barnes with a technical Knockout in the 45-48 kg weight category quarters at the ongoing XXI Commonwealth Games in Gold Coast yesterday. The only previous boxer to do so was renowned boxer Barney Henricus way back in 1950. Anusha who entered the ring as the favourite started her onslaught straight from the beginning. Barnes was never seen counter attacking as Anusha left no room for her opponent with a storm of heavy punches. Barnes seemed completely dazzled with Anusha’s fierce attack which she never expected so soon in the bout. Barnes was seen exhausted just moving on to the first minute of the bout. 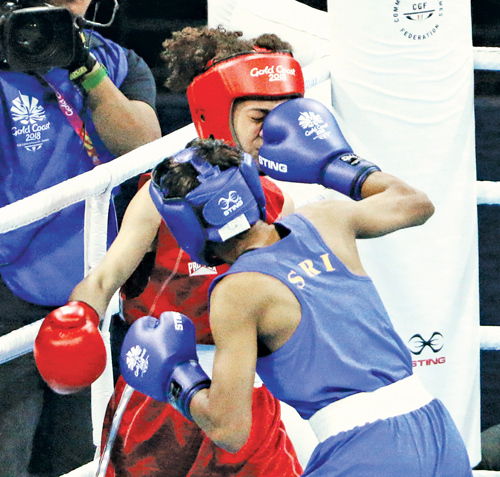 Anusha Dilrukshi (in Blue) punches Cayman Islands’ Brandy Barnes on her face during the women’s 45-48 kg category quarter final bout. Pictures by Prince Gunesekera. Her fitness was in such a bad state, that the referee had go for ‘count of eight’. On resumption too she was unfit and the referee had no other option than to stop the fight. The decision was made by the referee considering Barnes’ safety. Anusha’s victory not only made history but also push Sri Lanka a step close to another medal at the XXI Commonwealth Games. The second quarter final saw India’s renowned woman boxer M.C. Kom Mery win over Scotland’s Gordan Megan on points. Mery had to go full length to register a 10-8, 10-8, 10-8 quarter final win which lifted her to the semis. Wales’ Rosie Eccles was the third to qualify for the women’s 45-48 kg weight category semis, beating Tongan woman Magan Maka on points after a tough three-round quarter final battle. The last boxer to reach semis in this category was Australian Kaye Scott. She beat Nigeria’s Oriola Itunuon on points in yesterday’s quarters. Anusha Dilrukshi will take on India’s Mery Kom in the semifinal on Wendnesday while Eccles is due to fight Kaye Scott in the second semis. Anusha said that she is happy to create history by qualifying for the semifinal. “This is the first time I got an opportunity to fight in a competition of this magnitude. I was to fight Mery few years ago but did not meet her as I was met with an accident”. “I was selected to box at the last Commonwealth Games but due to another mishap I did not make the tour. Though I missed these two great opportunities I never gave my hope of representing the country as it was my main aim and I worked really hard for the last four years to make it for this Games. Today I have achieved my ambition to some extent and now my only aim is to bring a medal for my country. Until I win a medal I will not leave the ring sport,” she said. She thanked all who supported her to reach this milestone in Sri Lankan boxing field. 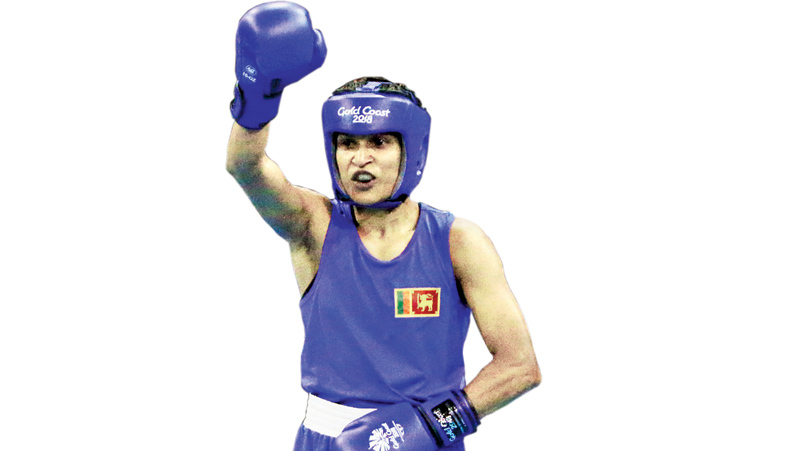 Dinudu Saparamadu appearing for the first time in the XXI Commonwealth Games boxing ring made his presence in the quarter final of men’s 64 kg class beating his New Zealand opponent Richard Hadlow on points. Dinudu fought gallantly from the first round to oust his opponent. Hadlow too made great efforts to stop the onslaught in Dinidu’s barrage of left, right jabs which he found hard to cope with. However in the second round Hadlow tried with everything he had in store to halt Dinidu’s venomous attack but all his efforts were failed making Dinidu the winner. Speaking soon after the fight Dinidu said that he has arrived in Australia few days back and did not have enough time to gain his normal fitness level. But with overcoming the first hurdle he is confident of gaining fitness and clinching a medal for Sri Lanka. “I will use all my experience and skill to try and grab a gold for Sri Lanka,” Dinidu said. The quarter final date will be notified soon. Mihiliya Methsarani who faced Meagan Best of Barbados in the women’s Squash Plate Championship final lost the game by one set to three (6-11, 13-11, 8-11, 8-11). With her yesterday’s defeat Mihiliya was placed at the seventeenth position out of sixty four players at the XXI Commonwealth Games 2018.